Holiday planning is in the air and the time for having some great fun in the sun and sea is fast approaching. While another wonderful season is about to begin and yacht owners are effortfully preparing to offer their services to new and return blue cruise travelers in Turkey. For first time Turkey yacht charter holidaymakers, it’s a time to do some research and find out information that will enable them to spend their vacation in a way they feel is for them. This may be with family members, close or distant; or with their friends. Either way part of the organizing is getting everyone together on the same travel dates. There isn’t too much to know about hiring a yacht in Turkey. The basics will get the ball rolling and then it’s just a matter of making a joint decision, fine tuning a few customized details, and then look forward to the time for when the journey begins. Below is a list of information that may be helpful to newbie blue cruise travelers. However, if you have been on a gulet cruise before, you may learned most of what there is to know, but sometimes – and this depends on your experience- you may not have learned all that there is in the basics. This is where it all starts. The group. Your group may be located in all different parts of the globe or the same city or house. But having to organize it so that everyone who wishes to come on a blue cruise holiday with you, is the first step. Your holiday starts to take form once you have established how many will be in your group. 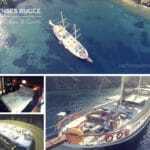 Gulet charters are offered in a wide range of prices. While the list prices are there simply for guidance and to give you an idea of rental cost, the final pricing will usually not be the same as what you see online. At this stage you and your group do need to have some idea as to how much you can spend for a private yacht rental so that offers can be sent accordingly, along with other criteria, for you to look over. 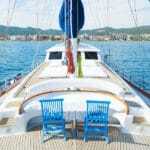 Since these are private yacht holidays, gulets are priced on a week long basis. This calculates to one week rental price divided by the number of members in the group, however paid not per person, but for the week in two payments. One payment to reserve the boat, the second and final, upon arrival to the gulet. Between Turkey and Greece, there are hundreds of combinations for itineraries. You can choose to do only Turkey, only Greece, mix the two countries up, only the Mediterranean part of Turkey, only the Aegean part of Turkey, or mix it all up. Even though there are well established routes, professionally laid out, you can alter them if the conditions are appropriate – meaning proper anchorage points, weather conditions, and budget. The longer your route or the more you go out to sea, the more it may cost. 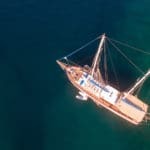 Gulet rental prices are based on the already laid out itineraries since 4 hours of cruising is included in these prices. Aaah the joy of dining at sea. It’s nothing like sitting in a restaurant and enjoying your meals. It’s a whole different atmosphere. A whole different taste. An altogether unique experience. Have it your way… have it grilled. Have is bbq’d or fried. Seafood dishes, fresh fish from the sea, meat and poultry, veggies, fruits and other sweet delights. The menus are offered in two types. There is the Standard Chef’s Menu and then there is the Exclusive Menu. 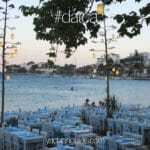 They are priced on top of the gulet rental price. However sometimes combined to offer as full board. Drinks at most times, not included at all as it is difficult to determine how much of what drinks guests will consume on board. Therefore local and import alcohol is always extra. For this, a list is sent to choose from or you can send your own list for the agent to buy on your behalf and have on board prior to your arrival. The contract stage is the final part of the whole chartering a yacht process. This is when all details have been confirmed, including travel dates, the boat, the menu, the itinerary, the price, and everything else in between. When the contract is issued, both parties are required to sign it and have a copy each. This can be done by fax or email. Once the contract is signed, the yacht owner is informed, so that the yacht is held until the first payment arrives. This however still does not guarantee the boat. It’s simply a preliminary booking and not final until the first payment arrives. Then the boat is yours and cannot be chartered to any other party for the same period. After the contract is signed and returned, you have 5 business days to send your funds. Should the funds not arrive on the 5th business day, a copy of the wire transfer receipt is acceptable proving that the monies were sent before the end of the 5th business day. If neither is sent, then the boat is open for charter to other clients for the same period as your travel dates.